The Sisters of the Order of Saint Benedict invite visitors to join us in prayer at any time listed below at either Saint Benedict’s Monastery in St. Joseph or Saint Scholastica Convent in St. Cloud. Please contact Saint Benedict’s Monastery at (320) 363-7100 or Saint Scholastica Convent at (320) 251-2225 if you have any questions. There are currently no changes to the schedule. Weekday Eucharist is celebrated at the Sacred Heart Chapel. Monday – Thursday: 5 p.m.
Friday: No Eucharist typically scheduled. Weekend Eucharist is celebrated at the Sacred Heart Chapel. The College of Saint Benedict celebrates Eucharist at 6 p.m. on Sundays during the school year. View the schedule. Eucharist is held at the chapel located at the convent. Monday – Friday: 8 a.m.
Liturgy of the Hours occurs in the Oratory, which is located in the lower level of the Gathering Place. Guests are welcome to join us. Monday – Friday: 7 a.m.
Saturday – Sunday: 8:15 a.m.
Monday – Friday: 11:30 a.m.
Friday – Sunday: 5 p.m.
Monday – Friday: 8:30 a.m.
Monday – Friday: 11:45 a.m.
Monday – Sunday: 4:30 p.m. There are times that the schedule changes for various reasons. Call (320) 251-2225 to verify times. The primary work of Benedictine monastics is prayer—the “work of God,” as the Rule of Benedict calls it. It is the daily rhythm of public and private prayer that provides the structure and the defining character of Benedictine life. As Jesus promised, God is present in the community gathered for prayer, and the awareness of that Presence becomes the integrating force in all dimensions of monastic life and ministry. In addition to periods of private prayer and lectio divina (meditative reading of Scripture), the sisters meet together to pray the Liturgy of the Hours morning, noon and evening in the Oratory, below Sacred Heart Chapel, and at the Saint Scholastica Convent chapel. According to the Rule of Benedict, the Benedictine community meets several times daily to participate in the Liturgy of the Hours. This ancient form of Christian worship consists of hymns, psalms, other passages from Scripture and Christian writings and prayers, interspersed with periods of silent reflection. 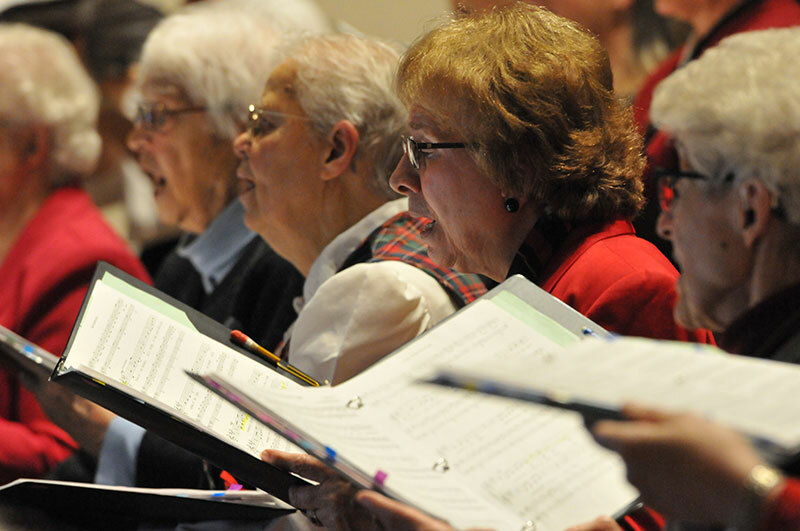 Through patterned word, music, gesture and silence, we give voice to all creation in praise of God. The Sisters of Saint Benedict welcome you to join them in prayer at Liturgy of the Hours and the Eucharist. For inspiration and to further your study of Benedictine monasticism, we suggest you reflect on the daily readings from the United States Conference of Catholic Bishops. Readings are drawn from the New American Bible, Revised Edition (NABRE), released in 2011. Audio readings are also available on the same page. “Schola” is short for Schola Cantorum, the Latin term for a school or group of people who join together to learn and sing ecclesial chant, the song of the church. It is a choir, but one dedicated to the ancient chant tradition, although that’s not the only music they sing. 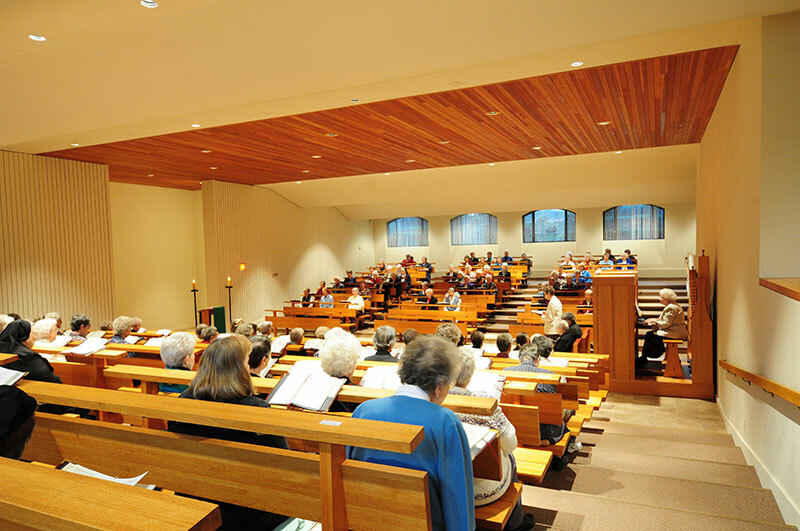 The schola is an integral part of prayer life at Saint Benedict’s Monastery and provides music leadership, as well as inspiration and encouragement to the gathered assembly.